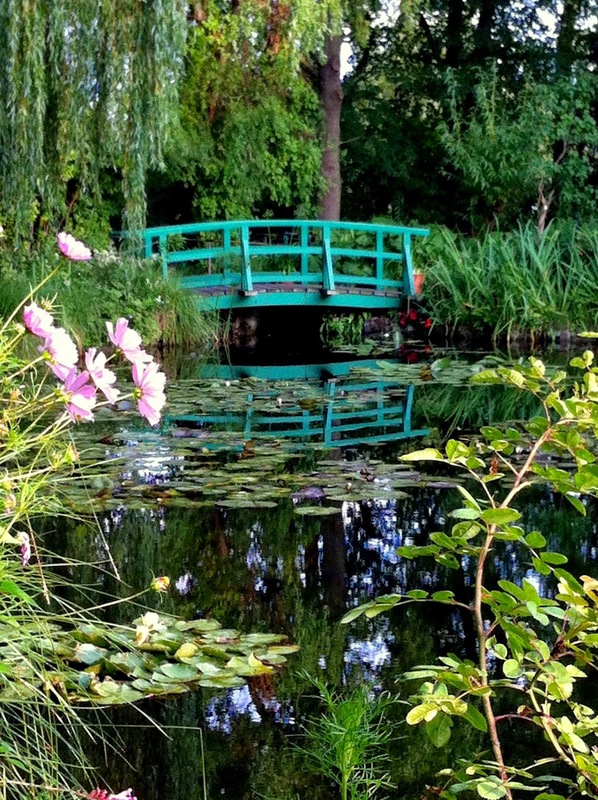 Come Paint in Monet's Garden! 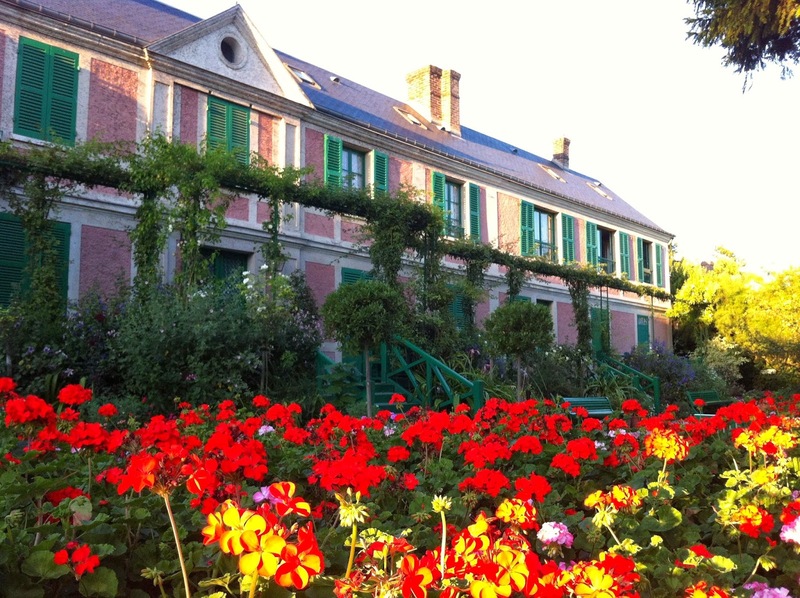 I’m very excited to share that I’ve arranged to be able to bring a small group of artists to paint privately in Monet’s Garden in Giverny France. This workshop/artists retreat will be June 4-11, 2015. It is only possible to take 8 people with me for this exclusive trip. I’ll be teaching both oils and watercolors. I taught there several years ago. 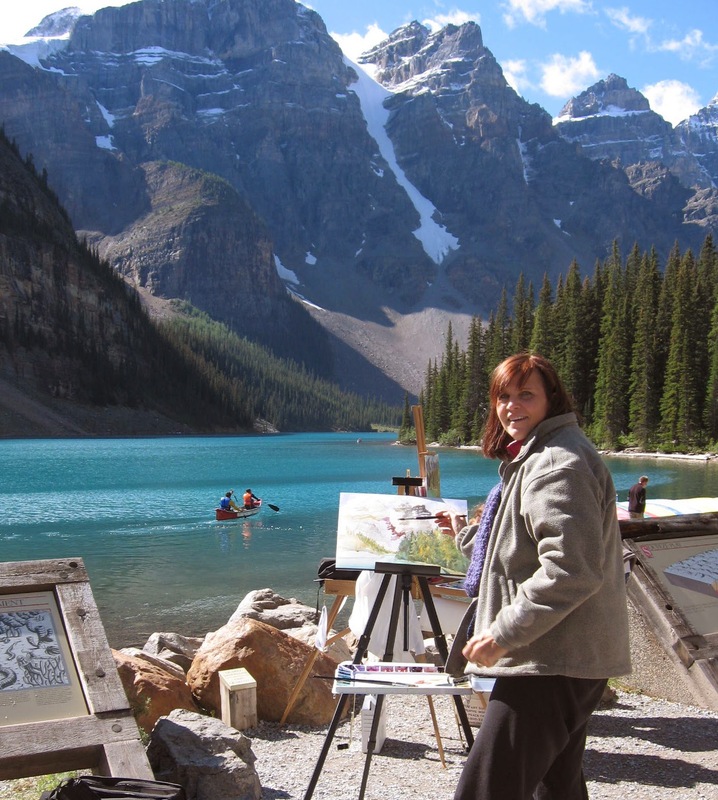 It was truly an exceptional experience to paint there -one of the highlights of my life. If this could be your painting dream of a lifetime, then contact me as soon as possible and I’ll share all the details. I’m sure the 8 spots will be snapped up quickly. So if you know this is something you want to do to reserve your spot, you can complete the application and submit to Rick Nuckolls at artcolonygiverny.com. Please let me know if you do so, so I can keep a list of who’ll be coming. The workshop will fill on a first come first serve basis. Here's a link to a pdf flyer on my website with more details. 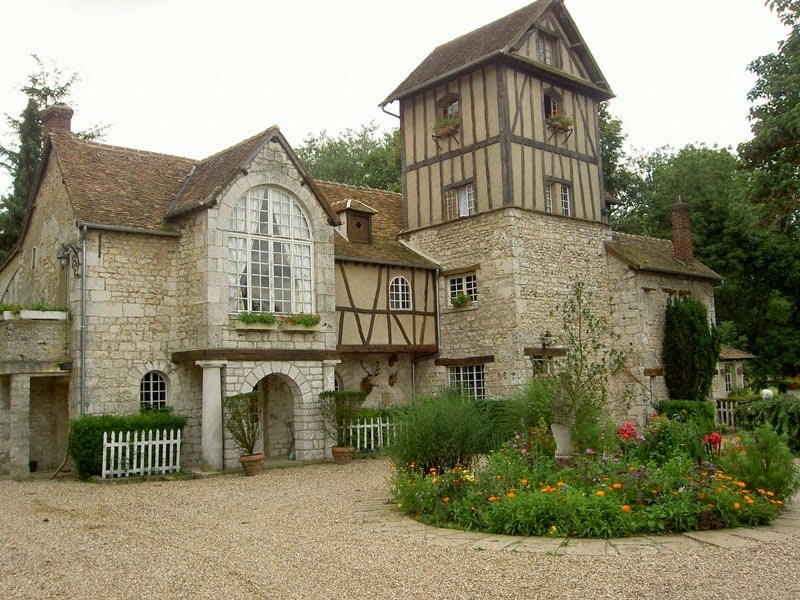 Where we will stay in the small village of Giverny, where time stands still. 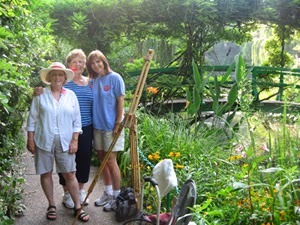 We will have special access to paint in the garden when it is not open to the public. Amazing experience to be there ( some have described it as almost a spiritual experience) paint there and bring home lots of fantastic photo references for future works and memories. I'm on a mission to share more beauty, love and inspiration in the world. Starting August 1, I'm initiating a campaign, 365 days of Beauty! 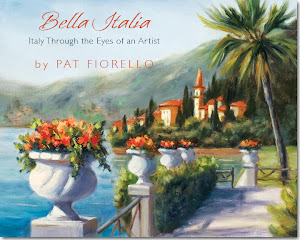 I'll post something of beauty everyday onto my Pat Fiorello, Artist Facebook page. Some days it will be new paintings and other times photo's of beautiful places or things that might provide a momentary escape to beauty! An occasionally I'll have some contests , giveaways and other fun ways to share beauty. Beauty can do so much for us-invoke a sense of wonder, peace, gratitude & joy in this busy world. Why not have more moments of beauty every day? Please Share with others who might enjoy a little more beauty in their lives too! Thank you! A small study in preparation for a larger painting of this scene of a french garden. Seeking to strike a delicate balance to get the sense of an energetic, lush, full garden without getting overly busy. Another take on an all white bridal bouquet designed by and outstanding Connecticut floral designer Jane Rynaski of Just for You Floral Design Studio. I had done a version for the bride last year and she wanted a dark background and to skew to the pink tones but based a photo of the same bouquet taken at a differnt angle, I decided to see how it would look in a higher key with warmer tones painted on a much larger scale. Here's the original below. I think both work, just 2 different interpretations and different moods for this exquisite bouquet. 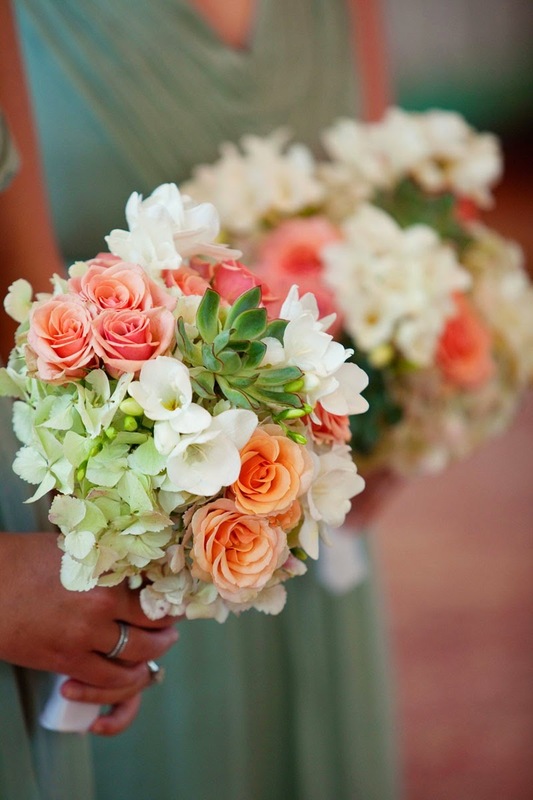 Here's another a bouquet with a fresh color palette from a wedding where the floral arrangements were designed by John Grady Burns of Flora by John Grady Burns based in Atlanta. John creates absolutely exquisite floral arrangements for many types of special occasions. I had the honor of studying with him at the Halls School of Floral Design where he is an instructor. 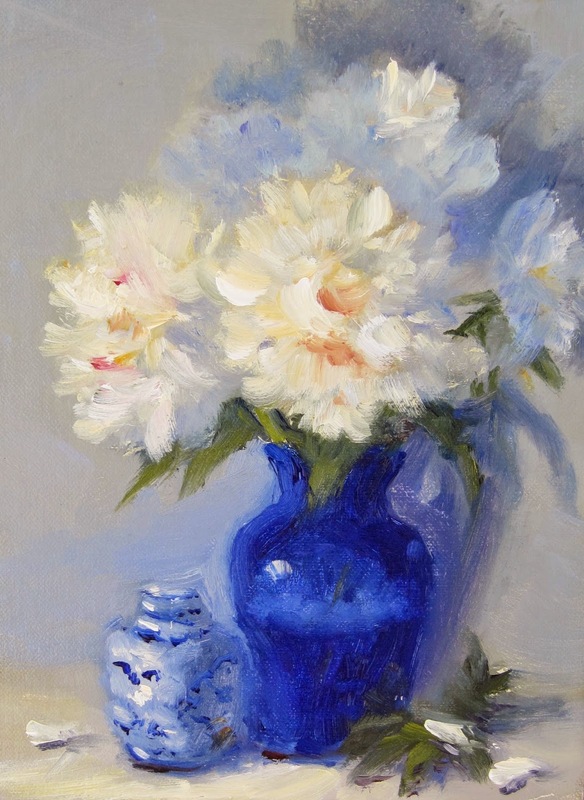 Photo of bouquet designed by John Grady Burns that served as inspiration for my painting. I'm working on a display with examples of my bridal bouquet paintings. Since the brides have the originals I needed to recreate some examples in a larger format. 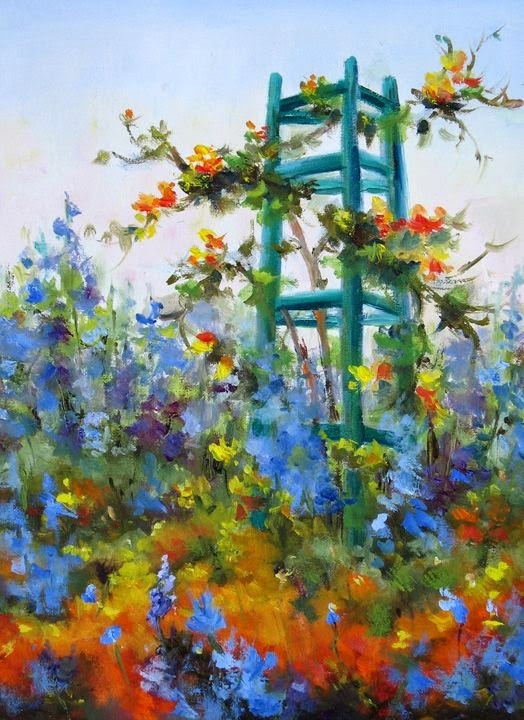 This is similar to one I did last year of a wedding venue- flowers at an outdoor gazebo where a ceremony was held. The floral arrangements for this wedding were done by the talented floral designer Anik Keuller of Anik Designs. Her creations always have a beautiful sense of style, flow and artistry. I also took photos in my studio along the way so you can see this painting unfold before your eyes. 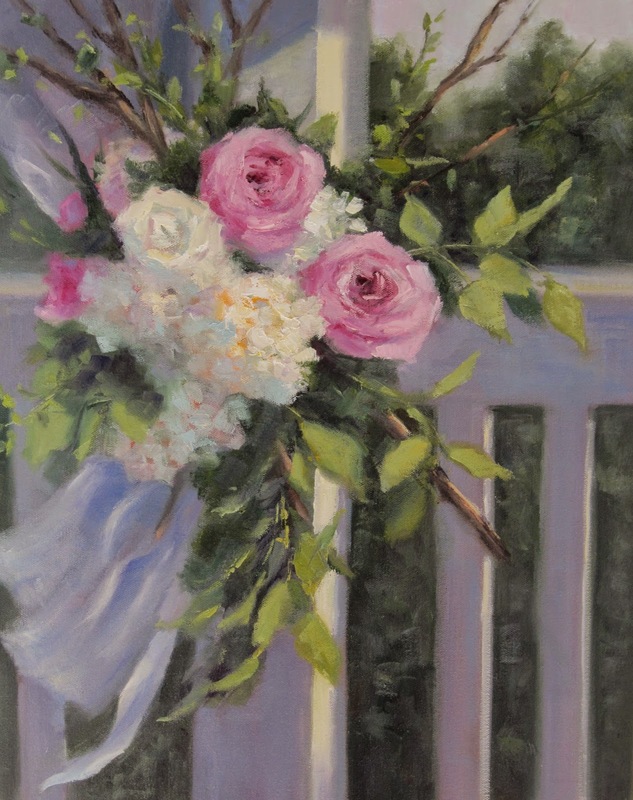 To learn more about my custom bridal bouquet paintings, click here. 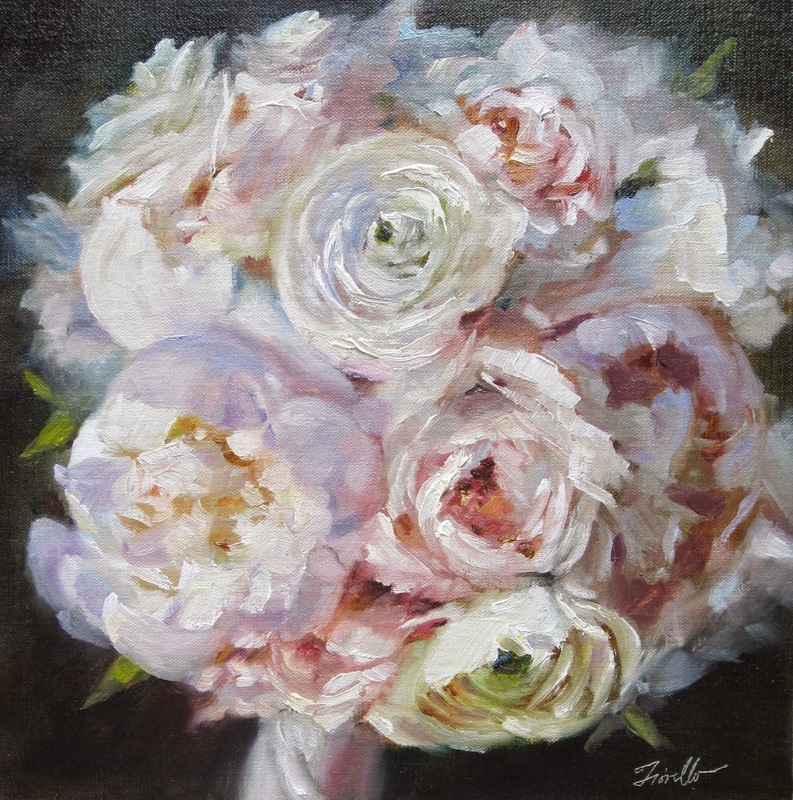 My "Forever Bouquet Paintings" are special way to keep your own wedding day memories alive forever or to give a unique and memorable gift to a favorite couple. Contact me via my website contact page or Facebook page if you are interested in learning more. I'm reposting this painting shared a few weeks ago, because I have created a short step by step video to share my approach in creating this painting. You can see it on youtube and it's posted below as well. What medium do you want to work in? Subject matter-landscape, light, what the area is uniquely known for? What will be the physical requirements of painting outdoors (walking, weather, carrying gear), are their accomodations if you have any limitations? 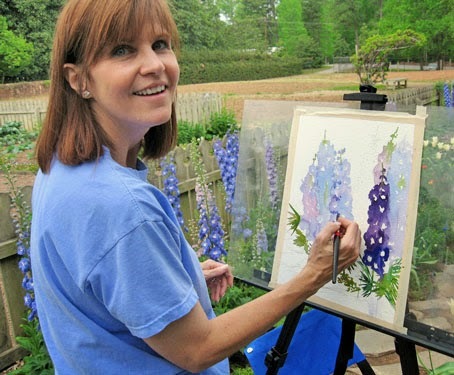 Will there be activities for a spouse or travel companion who may not be painting? Be sure to plan way in advance. Workshops often have limited space and sell out early. Look in the back of art magazines for ads or search on line, Shaw guides for workshop options. Enjoy the anticipation of looking forward to a very special experience! If you'd like to join me on a fun painting adventure, please contact me. My workshops are listed on www.patfiorello.com. 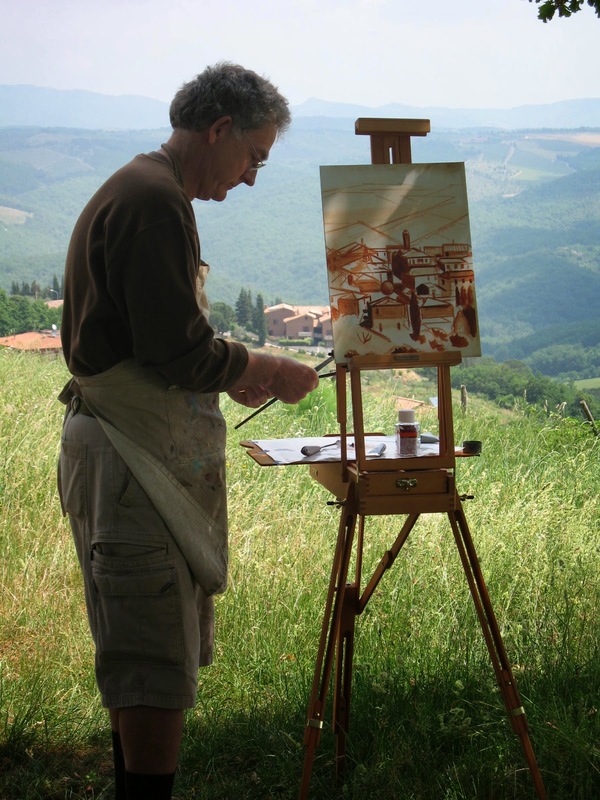 I have another adventure to Tuscany in September 20-27, 2014 and stayed tuned to my "Bringing Beauty to the World" Newsletter for exciting new 2015 travel workshops to be announced in August. Did a private demo for a student the other day who wanted to better understand my working process and methods. Below is a short video that shows how this painting unfolded. Generally (but not always), when I paint flowers, I like to start with a transparent underpainting followed by developing the painting with opaque paints. Click below to watch the painting unfold before your eyes. 10. Meet and learn from other artists from around the country (& world). A way to travel with people who share your passion. Make new friends. 3. Accelerates your learning- day after day concentrated period, group critiques, can immediately apply learning the next day while fresh in your mind. See progress from the first to last days. 2. Can be a life enriching, transformative growth experience. Out of your comfort zone, in a different place away from everyday life. Personal growth- more than a workshop- adult enrichment. 1. Come back motivated to paint even more- gets you back in touch with what you love about being an artist, observing the beauty around you and expressing that in your own unique way. And HAVE FUN!!!! Took a small study I did a few weeks back and scale it up much larger . The challenge in scaling something up larger is you often need more information, otherwise it looks empty and unfinished. 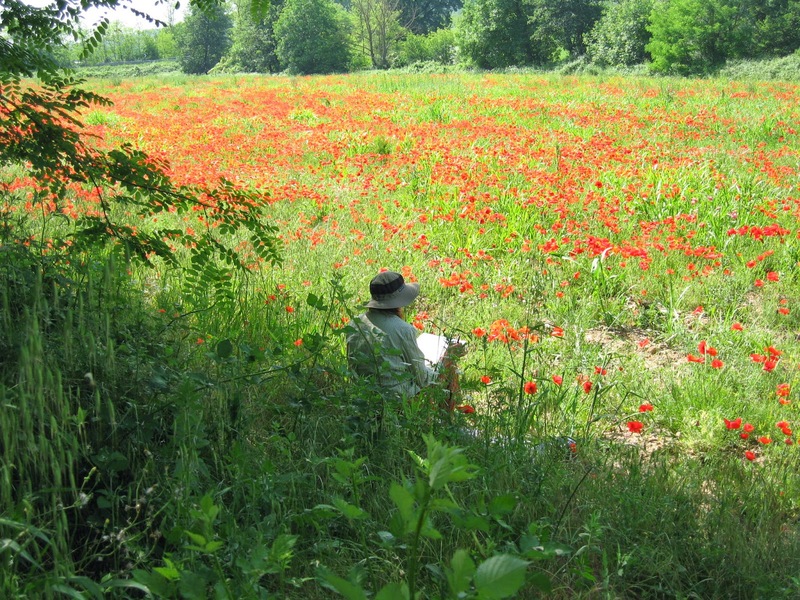 In this one, I fortunately had some good references to remind me of the feeling of this field which I came across recently while in in Provence. Another specific type of challenge with this type of subject is managing the delicate balance between having it complex enough to communicate the feeling so busy-ness and chaos of the wildflowers and not getting it so busy that it's overwhelming. Hopefully struck a good balance in this one. The study and some sample reference photos are shown below. 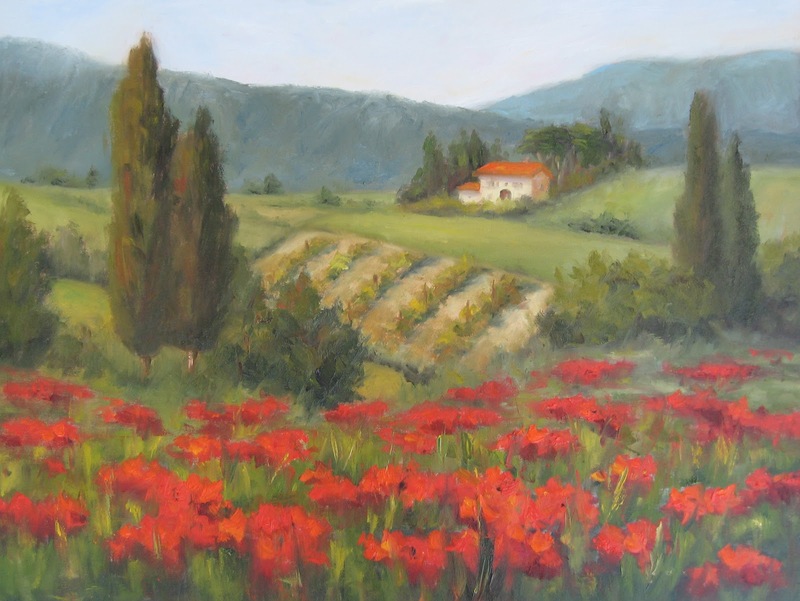 This large painting was commissioned by a client who wanted to have an ongoing reminder of her wonderful visit to Tuscany in her home. 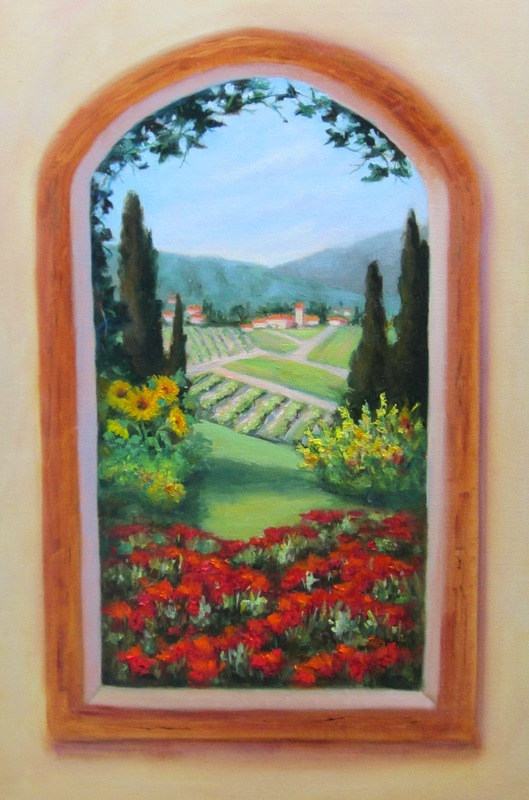 During our initial Design Session, she shared her memories, some of her specific requests for things she did and did not want in the painting including her interest in having a view from a window so that she could feel she was looking out to Tuscany each time she passed the painting. She didn't provide any of her own photo's so I created this imaginary scene including many of the elements that are characteristic of the Tuscan landscape. 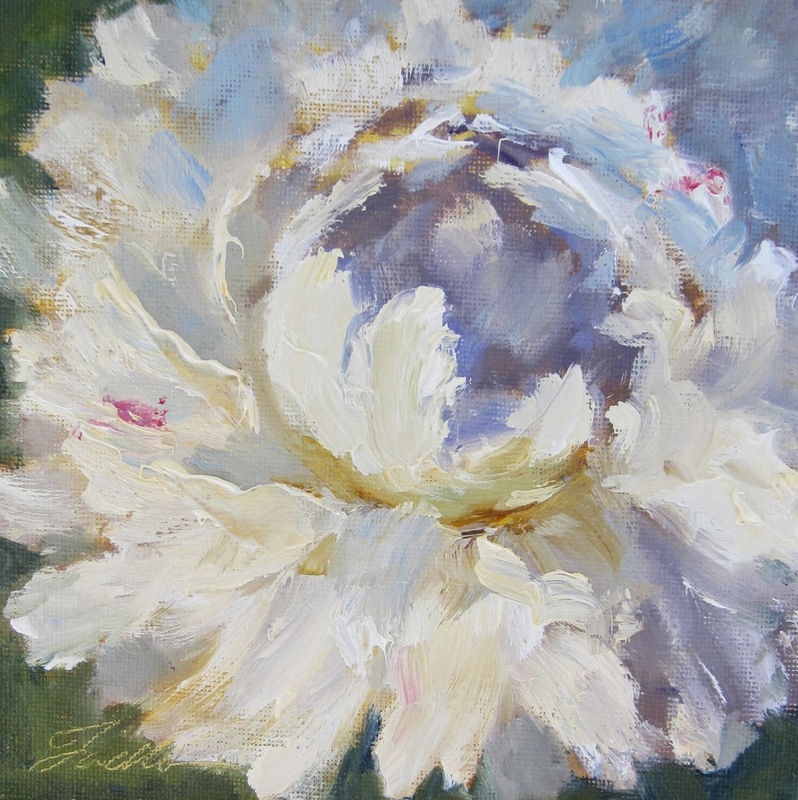 Before my fresh peonies started to wilt, I thought I'd get in one more painting. This one a close-up study to get the feeling of it's form under light. They really are so soft and fluffy so it's a fun opportunity to use lots of thick paint and brushwork to suggest that texture. Took the flowers from my last painting"Waterford" and rearranged my "models" with other props for a small painting with different look and feel. I wanted to share some blog posts from a previous July that may be of interest to you in case you missed them or may be a new blog follower since they were originally posted. The blogposts may be helpful if you decide to take this assignment on for yourself. But of course, the real learning comes from doing it, not reading about it. So it you are ready to take your understanding of color to a deeper level, I encourage you to take on this challenge for yourself. You can read the blogposts for some guidance to get you inspired, but get your brushes wet! If I can be of assistance, please get in touch with a comment.